About 72 percent of the work on the final phase of the Colombo Outer Circular Highway (OCH) is complete and will be finished in 2019, Road Development Authority (RDA) Project Director of the OCH Phase Three N. K. L. Nettikumara said. He said the third and final phase of the OCH (OCH-3) from Kadawatha to Kerawalapitiya, extending 9.63 kilometers is a four-lane expressway with two interchanges (Kaduwela and Kadawatha), including toll plazas and facilities. 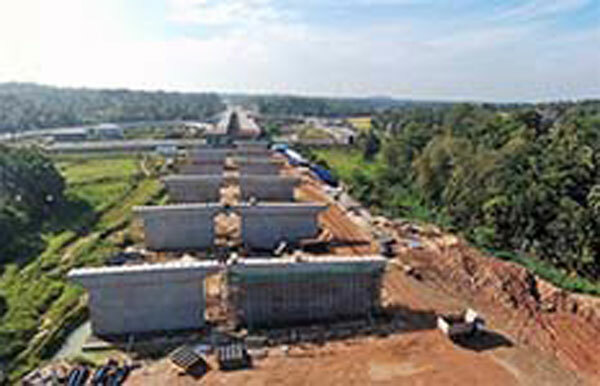 Three viaducts over 6.3 kilometers in length are being constructed over the Muturajawela wetland area, Ragama and Kadawatha, close to the starting point of the proposed Colombo - Kandy Central Expressway. “Once the third section from Kaduwela to Kerawalapitiya is complete, the OCH will link Southern Expressway and Colombo Katunayake Expressway. "It will then act as a link between the North and South, bypassing the inner city area, thereby easing the traffic congestion in the city,” he said. The second phase of the Outer Circular Highway from Kaduwela to Kadawatha was opened to the public in September 2015, while the first phase from Kottawa to Kaduwela was opened in March 2014. The third stage of the project is implemented by the Road Development Authority under the supervision of the Highways and Road Development Ministry with the financial support from the Chinese government.